A COLLABORATIVE EFFORT TO DOCUMENT THE COLLECTIONS MY HUSBAND AND I SHARE. Kikaider almost got left behind when Jacob couldn't bear to split up Kamen Rider Stronger and Tackle...but was also trying to stick to a budget while visiting the Misfit Toys booth at Space City Comic Con last weekend. Luckily, he convinced me to wake up early this morning and attend the Grand Opening of the Misfit Toys storefront in the Heights, where Kikaider was patiently waiting to come home with us (surrounded by Kaiju galore). Kikaider 01 is probably my favorite addition to Jacob's collection in quite a while. His details and colors are just so unusual and bold. I really love that his face plate is removable, exposing his weirdo circuit details underneath. Tackle is a major cutie, but she's missing her little antenna on the front of her helmet. We love her just the same. Kamen Rider Stronger also has really great details; I especially like his bug eyes and antenna. How can Kikaider even be so cool? Why does he look the way he does and what are his special abilities? He's awesome, right?! The clear casing over the visually exposed circuitry is just such a cool and evocative design choice that instantly gets across the fact that it's supposed to be a robot. 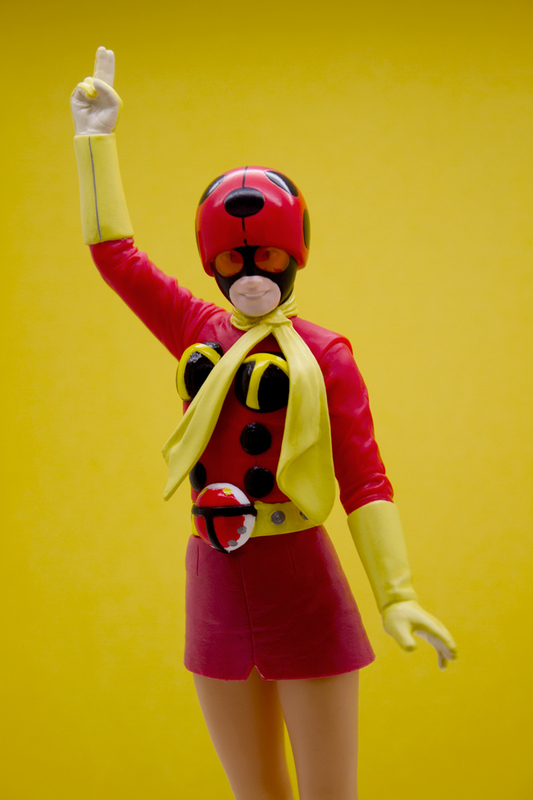 Kikaider 01 (who is actually the second Android Kikdaider!) has his distinctive split color scheme largely because of the design of the previous Kikaider, who has a reversed Blue/Red palette and only his head circuitry visible. As for powers, they're your pretty standard Super Fighting Robot Hero sort of things. You know - like rocket boots, finger lasers, flying kicks! His signature attack, the 01 Driver, is basically a flying double corkscrew punch, which is pretty cool! What is Tackle's role on Kamen Rider? Does the emblem on her belt do anything special? Tackle is cool in that she's the first female Kamen Rider hero with powers. She's still treated like a sidekick, even though she's a pretty selfless hero in her own right, eventually sacrificing her life to save Stronger. So the belt that she wears is what is usually called Typhoon and is what allows the cyborgs in Kamen Rider to transform from their civilian outfits to their Kamen Rider suits. What's your favorite thing about Kamen Rider Stronger? What's the significance of his helmet design? I'm crazy for how bulky the suit Stronger wears is! All of the classic Kamen Riders have pretty bulky looks, but his chest piece is huge! So, the first few Riders were grasshopper themed (which is weird, right?) and Stronger sort of fits into that mold because and his helmet were based on the Japanese rhinoceros beetle.